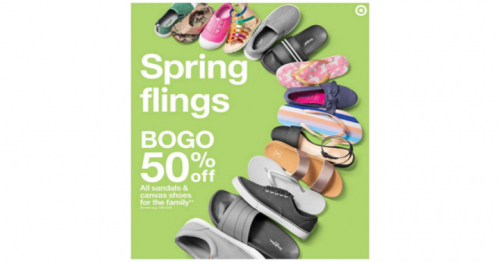 BOGO 50% Off Shoes at Target This Week! Home→Target→BOGO 50% Off Shoes at Target This Week! Time to grab some new kicks this week at Target! They are offering a great promotion. When you buy one pair of shoes you will get another for 50% Off. You can shop online or in store. Pick up shoes for Easter or just for summertime. Kids grow so fast that finding deals on shoes is a must. You can check out the deal options below by clicking the “Shop Now” button below.